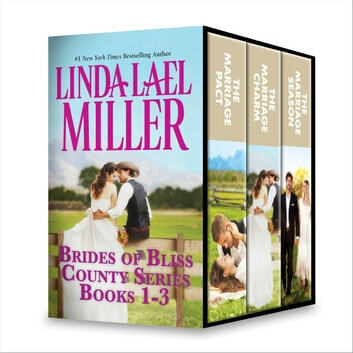 Join #1 New York Times bestselling author Linda Lael Miller in Bliss County, where the women are ready to meet the men of their dreams! Ten years ago, Hadleigh Stevens was eighteen and this close to saying "I do," when Tripp Galloway interrupted her walk down the aisle. Now that she’s recovered from her youthful mistake and Tripp’s interference, Hadleigh and her single friends form a marriage pact. She doesn’t expect Tripp to meddle with her new plan to find Mr. Right—or to discover that she’s more attracted to him than ever! 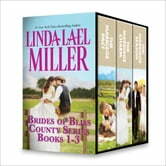 The women of Bliss County have a pact—to find husbands. The right husbands. One already has: Hadleigh Stevens, who married rancher Tripp Galloway a few months ago. Now Melody Nolan thinks it’s her turn. Melody has recently found success as a jewelry designer, and her work is the focus of her life. She’s not exactly unhappy, but she wants more. She’s always been attracted to Spence Hogan, the local chief of police, but she’s convinced that Spence, a notorious charmer, isn’t what you’d call husband material. Spence is a good cop who isn’t scared of anything—except love. And yet…there’s something about Melody. Something his heart can’t ignore. Since Hadleigh, Melody and Bex—the best of best friends—entered into a marriage pact, two of them have found (and married) the men of their hearts. But Bex doesn’t think she’ll be as fortunate as the others. Then single father Tate Calder comes to Mustang Creek with his two sons in tow, boys who befriend Bex’s eightyearold nephew. Which means she and the handsome, aloof newcomer are constantly thrown together. But is the marriage season over? Or can a man with doubts about love be the right husband for a woman who wants it all?